Treatment of emerging RNA viruses is hampered by the high mutation and replication rates that enable these viruses to operate as a quasispecies. Declining honey bee populations have been attributed to the ectoparasitic mite Varroa destructor and its affiliation with Deformed Wing Virus (DWV). 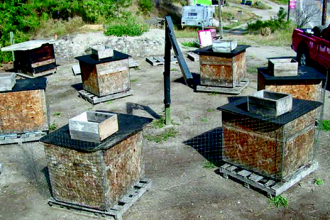 In the current study we use next-generation sequencing to investigate the DWV quasispecies in an apiary known to suffer from overwintering colony losses. We show that the DWV species complex is made up of three master variants. 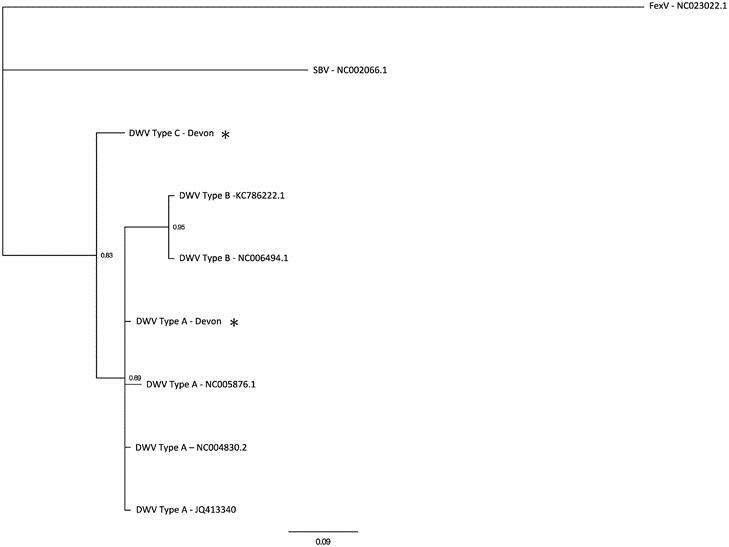 Our results indicate that a new DWV Type C variant is distinct from the previously described types A and B, but together they form a distinct clade compared with other members of the Iflaviridae. The molecular clock estimation predicts that Type C diverged from the other variants ~319 years ago. The discovery of a new master variant of DWV has important implications for the positive identification of the true pathogen within global honey bee populations. RNA viruses have rapid replication and high error rates, leading to immense diversity within each viral replication cycle (Domingo and Holland, 1997). As a result, many RNA viruses are highly genetically heterogeneous and exist within infected population structures known as quasispecies. It has been proposed that this gives these viral pathogens an increased ability to shift to a new environmental niche, such as a new host, as a suitable mutant is more likely to already exist if this opportunity arises. However, if the diversity within a quasispecies becomes too high, deleterious mutations can accumulate leading to loss of overall fitness (Clarke et al., 1993). The adaptability and host range of a virus are a function of the level of diversity found within a quasispecies (termed the quasispecies swarm size) (Schneider and Roossinck, 2001). As well as a randomly generated swarm of mutants around one variant, quasispecies can also exist as a number of master variants, each with their own swarm of random mutations (Palacios et al., 2008; Lauring and Andino, 2010). Determining the extent of genetic heterogeneity in virus populations thus has important implications for predicting and preventing emerging viral diseases. The global decline in honey bee populations over the past few decades has been attributed to the ectoparasitic mite Varroa destructor and its affiliation with Deformed Wing Virus (DWV) type A variant (Dainat et al., 2012; Martin et al., 2012; Schroeder and Martin, 2012; Francis et al., 2013). The role of honey bees as pollinators is vital to the environment and economy, as bees are a key pollinator species for agriculture. 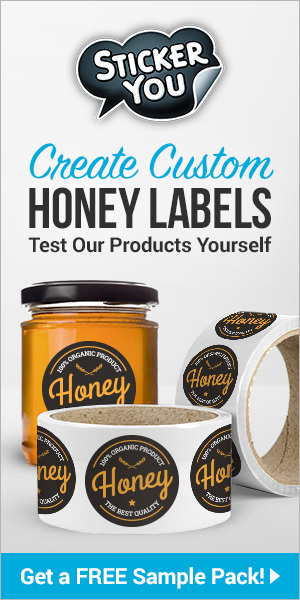 The economic value of honey bees is estimated to be more than 225 billion US dollars worldwide (Gallai et al., 2009). DWV, a member of the single-stranded positive-sense RNA genus Iflavirus (Lanzi et al, 2006), exists as a group of closely related viruses, often considered as variants of the same species complex (Ryabov et al., 2014). The ICTV (The International Committee on Taxonomy of Viruses) database categorises DWV type A as two variants, DWV (Lanzi et al, 2006) and Kakugo virus (KV) (Fujiyuki et al., 2004). A second closely related virus Varroa destructor virus-1 (VDV-1) is also part of the genus Iflavirus, which is now designated DWV type B (Martin et al., 2012; Mordecai et al., 2015). DWV type B was designated a separate species based on a nucleotide identity to DWV type A of ~84% that, according to demarcation criteria, is sufficient dissimilarity to warrant the creation of a new master variant (Fauquet et al., 2005). VDV-1 was originally isolated from V. destructor but has since been reported to replicate in honey bees (Ongus et al., 2004; Zioni et al., 2011) where it has been shown to cause wing deformities in bees (Zioni et al., 2011). DWV type B was also recently found to dominate the DWV population in honey bees from an isolated apiary in Swindon, UK (Mordecai et al., 2015); to the apparent exclusion of any other master variants. In honey bee populations that have never been exposed to Varroa mites, DWV exists in a very large variant swarm with numerous master variants (Martin et al., 2012). However, transmission of DWV by Varroa reduces variant diversity to one master variant (Martin et al., 2012). Therefore, DWV exists as an endlessly mutating swarm of variants with these master variants constituting part of this quasispecies and sharing a recent common ancestor (Baker and Schroeder, 2008; Martin et al., 2012). The dominance of one master variant over another will lead to ultimately different life histories for the colony, that is, death if DWV type A dominates (Martin et al., 2012) or health if DWV type B dominates (Mordecai et al., 2015). 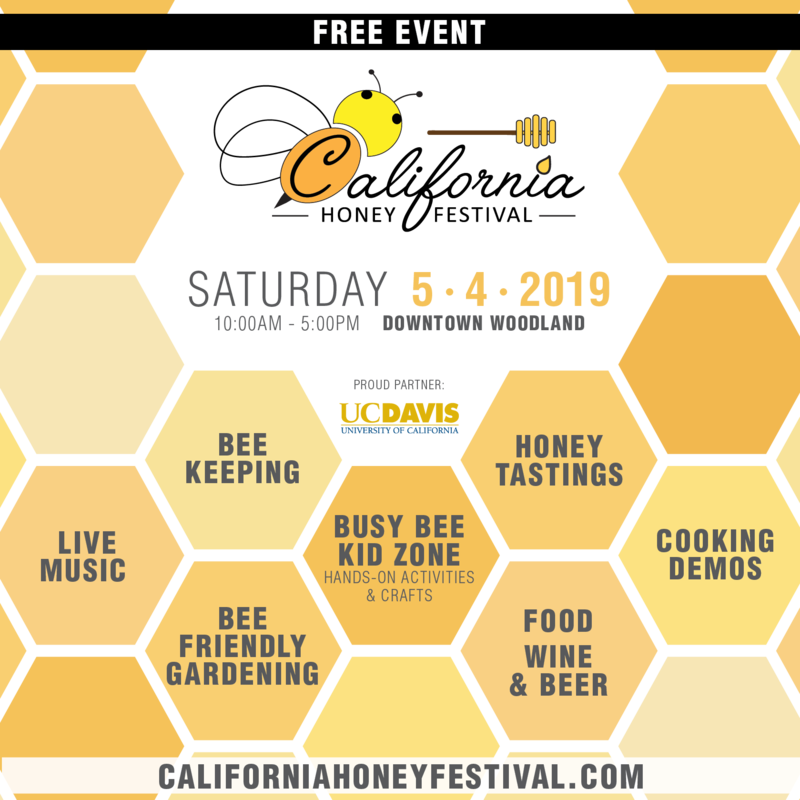 Next articleCATCH THE BUZZ – Another Look at Neonics, Honey Bees, and Colony Losses.